Junior Ellie Fair will look to lead the Wreckers in 2017-18 after Staples made it to the Class LL playoffs last season with 11 wins. Sat, 12/16 — Bullard Havens Tech (Home) - Staples H.S. Gym — 5:45 p.m.
Fri, 12/22 — Trinity Catholic (Home) - Staples H.S. Gym — 7:00 p.m. Wed, 12/27 — Kolbe Cathedral (Neutral) - Wilton H.S. — 5:00 p.m. Wed 1/3 Danbury (Away) - Danbury H.S. - MAIN gym — 7:00 p.m.
Fri, 1/5 Fairfield Warde (Away) - Fairfield Warde Large Gym — 7:00 p.m.
Tue, 1/9 Wilton (Home) - Staples H.S. Gym — 7:00 p.m.
Thu, 1/11 Trumbul (Away) - THS Main Gym — 7:00 p.m. Wed, 1/17 Bridgeport Central (Away) - Central H.S. Gym — 7:00 p.m.
Fri, 1/19 Greenwich (Home) - Staples H.S. Gym — 7:00 p.m.
Tue, 1/23 Norwalk (Home) - Staples H.S. Gym — 7:00 p.m.
Fri, 1/26 Brien McMahon (Away) - Brien McMahon H.S. — 7:00 p.m.
Tue, 1/30 Westhill (Away) - Main Gymnasium — 7:00 p.m.
Thu, 2/1 Stamford (Home) - Staples H.S. Gym — 7:00 p.m. Sat, 2/3 Trumbull (Home) - Staples H.S. Gym — 1:00 p.m.
Tue, 2/6 Darien (Home) - Staples H.S. Gym — 7:00 p.m.
Fri, 2/9 Ridgefield (Away) - RHS Main Gym — 7:00 p.m.
Mon, 2/12 Fairfield Ludlowe (Home) - Staples H.S. Gym — 7:00 p.m.
Mon, 2/19 New Canaan (Away) - NCHS Gymnasium —7:00 p.m. Wed, 2/21 St. Joseph (Home) - Staples H.S. Gym — 7:00 p.m.
Thu, 12/14 Bethel (Away) - Bethel H.S. — 7:00 p.m.
Fri, 12/15 New Canaan (Home) - Staples H.S. Gym — 7:00 p.m.
Tue, 12/19 St. Joseph (Away) - St. Joseph H.S. Gym — 7:00 p.m.
Fri, 12/22 Trinity Catholic (Away) - Walsh Court — 5:30 p.m. Wed, 12/27 Holiday Tournament (Neutral) - Fairfield Ludlowe Gym — 12:15 p.m. Wed, 1/3 Danbury (Home) - Staples H.S. 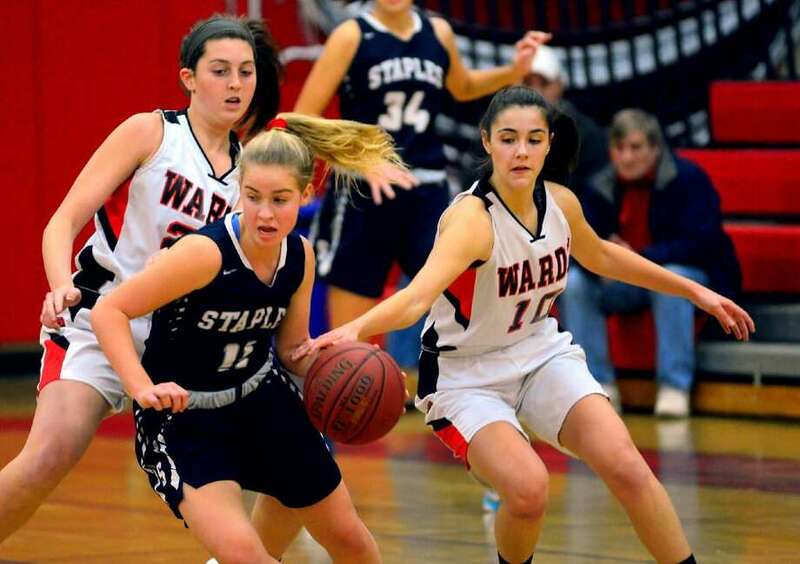 Gym — 7:00 p.m.
Fri, 1/5 Fairfield Warde (Home) - Staples H.S. Gym — 7:00 p.m.
Tue, 1/9 Wilton (Away) - Nicholas Zeoli Field House — 7:00 p.m. Wed, 1/10 New Canaan (Home) - Staples H.S. Gym — 7:00 p.m.
Fri, 1/12 Trumbull (Home) - Staples H.S. Gym — 7:00 p.m.
Tue, 1/16 Bridgeport Central (Home) - Staples H.S. Gym — 7:00 p.m.
Fri, 1/19 Greenwich (Away) - GHS Gymnasium — 7:00 p.m.
Tue, 1/23 Norwalk (Away) Norwalk High Gym — 5:30 p.m.
Fri, 1/26 Brien McMahon (Home) - Staples H.S. Gym — 7:00 p.m.
Tue, 1/30 Westhill (Home) - Staples H.S. Gym — 7:00 p.m.
Thu, 2/1 Stamford (Away) - Stamford H.S. — 7:00 p.m.
Tue, 2/6 Darien (Away) - DHS Main Gym — 5:30 p.m.
Fri, 2/9 Ridgefield (Home) - Staples H.S. Gym — 7:00 p.m.
Mon, 2/12 Fairfield Ludlowe (Away) - FLHS Main Gym — 7:00 p.m. Wed, 12/20 Branford (Away) - Northford Ice Pavilion — 8:30 p.m. Sat, 12/23 Daniel Hand (Home) - Milford Ice Pavilion — 3:00 p.m. Wed, 12/27 NFA (Away) - Norwich Free Academy — 5:00 p.m. Sat, 12/30 Amity (Home) - Milford Ice Pavilion — 3:00 p.m. Wed, 1/3 E.Haven/O.Lyme /O.Saybrook/E.Hampton (Away) - Dilungo Rink — 7:00 p.m. Sat, 1/6 Masuk (Home) - Milford Ice Pavilion — 6:15 p.m. Wed, 1/10 Trumbull (Away) - Shelton Rinks — 6:30 p.m. Sat, 1/13 Norwalk-McMahon (Away) - SoNo Ice House — 8:00 p.m.
Tue, 1/16 St. Joseph (Away) - Shelton Rinks — 8:00 p.m.
Thu, 1/18 Darien (Away) - Darien Ice Rink — 7:20 p.m. Wed, 1/24 Lyman Hall/H-K/Coginchaug (Home) - Milford Ice Pavilion — 8:00 p.m. Sat, 1/27 Trinty Catholic (Home) - Milford Ice Pavilion — 8:00 p.m. Wed, 1/31 Fairfield Warde/Ludlowe (Home) - Milford Ice Pavilion — 8:00 p.m. Sat, 2/3 New Canaan (Home) - Milford Ice Pavilion — 8:00 p.m. Wed, 2/7 Wilton (Home) - Milford Ice Pavilion — 8:00 p.m. Wed, 2/14 Greenwich (Home) - Milford Ice Pavilion — 6:00 p.m. Sat, 2/17 Ridgefield (Home) - Milford Ice Pavilion — 8:00 p.m.
Tue, 2/20 North Branford (Away) - Northford Ice Pavilion — 4:00 p.m.
Fri, 2/23 Enfield/E. Granby/Stafford (Home) - Milford Ice Pavilion — 8:00 p.m. Sat, 12/9 ND-Fairfield/Law/Foran/Weston (Home) - Terry Conners Ice Rink — 3:20 p.m. Wed 12/13 Avon (Home) - Terry Conners Ice Rink — 6:00 p.m.
Fri, 12/15 Ridgefield/Danbury (Away) - Winter Garden Ice Arena — 3:45 p.m. Sat 12/16 Branford/E. Haven/N. Branford (Away) - East Haven Ice Rink — 5:30 p.m.
Mon 12/18 Mercy/NW Catholic (Away) - Champions Skating Center — 4:50 p.m. Wed, 12/20 Darien (Home) - Terry Conners Ice Rink — 5:40 p.m.
Tue, 1/2 Greenwich (Away) - Dorothy Hamill Ice Rink — 4:45 p.m.
Mon, 1/8 Masuk/Barlow/Newtown/Oxford (Home) - Terry Conners Ice Rink — 5:00 p.m. Wed, 1/10 Wilton/Norwalk/McMahon (Home) - Terry Conners Ice Rink — 5:40 p.m. Sat, 1/13 New Canaan (Home) - Terry Conners Ice Rink — 5:00 p.m.
Mon, 1/15 Trumbull/St. Joseph (Away) - Shelton Rinks — 12:15 p.m. Wed, 1/17 Hand/Coginchaug/Old Lyme (Home) - Terry Conners Ice Rink — 4:00 p.m. Sat, 1/20 Fairfield Ludlowe/Warde (Home) - Terry Conners Ice Rink — 2:00 p.m. Wed, 1/24 Ridgefield/Danbury (Home) - Terry Conners Ice Rink — 5:40 p.m. Sat, 1/27 Darien (Away) - Darien Ice Rink — 7:40 p.m. Sat 2/3 Greenwich (Home) - Terry Conners Ice Rink — 8:00 p.m.
Tue 2/6 Wilton/Norwalk/McMahon (Away) SoHo Icehouse — 6:00 p.m. Sat 2/10 New Canaan (Away) — Darien Ice Rink — 7:00 p.m. Wed 2/14 Trumbull/St. Joseph (Home) - Terry Conners Ice Rink — 7:50 p.m.
Fri 2/16 Fairfield Ludlowe/Warde (Away) - Wonderland of Ice — 6:00 p.m. Wed, 12/13 Greenwich (Away) GHS Gymnasium — 5:00 p.m. Sat, 12/16 Ludlowe Invitational (Away) — Ludlowe Gym — 10:00 a.m. Wed, 12/27 Danbury, Darien, Norwalk (Away) — Danbury H.S. — 10:00 a.m. Sat, 12/30 Maloney, New Britain, Amity (Away) — Maloney H.S. — 10:00 a.m. Wed, 1/3 Trumbull (Away) — Auxiliary Gym — 6:00 p.m. Sat, 1/6 Warde Invitational (Away) — Warde Gym — 10:00 p.m. Sat, 1/13 Staples Duals (Home) — Staples H.S. Gym — 10:00 a.m. Wed, 1/17 Westhill (Away) — Westhill New Gym — 5:00 p.m. Sat, 1/20 John Chacho Duals (Home) — Staples H.S. Gym — 10:00 a.m. Wed, 1/24 Stamford (Home) — Staples H.S. Gym — 7:00 p.m. Wed, 1/31 Ridgefield (Home) — Staples H.S. Gym — 7:00 p.m.
Tue, 2/6 Fairfield Warde (Home) — Staples H.S. Gym — 6:00 p.m. Sat, 12/16 FCIAC Qualifer No.1 (Home) — Staples Field House — 10:00 a.m. Wed, 12/27 Jack Long Invitational (Away) — Hillhouse — 11:30 a.m. Sat, 1/6 FCIAC Qualifer No.2 (Home) — Staples Field House — 10:00 a.m. Sat, 1/13 FCIAC Qualifer No.3 (Home) — Staples Field House — 10:00 a.m. Sat, 1/3 SCC Coaches Invitational (Away) — Hillhouse — 2:00 p.m.
Fri, 1/19 Yale Invitational (Away) — 1:00 p.m. Sat, 1/20 Yale Invitational (Away) — 9:00 a.m. Sat, 1/27 FCIAC Western Division Championship (Home) — Staples Field House — 10:00 a.m.
Thu, 2/1 FCIAC Championship (Away) — Hillhouse — 4:00 p.m. Sat, 2/10 CIAC Class LL Championships (Away) — Hillhouse — 10:00 a.m. Sat, 2/17 CIAC Open Championship (Away) — Hillhouse 12:00 p.m. Sat, 12/16 AT&T Coaches Hall of Fame (Away) — 12:00 p.m.
Fri, 12/29 Marine Corp Holiday Classic (Away) — 9:00 a.m.